First read Eileen Webb's post, "Training the CMS" for background (thanks Paceaux, for the great recommended reading). "Everyone, please feel free to share any tools, modules, plugins, or tutorials you’ve come across for your favorite CMS that can help improve the authoring experience!" 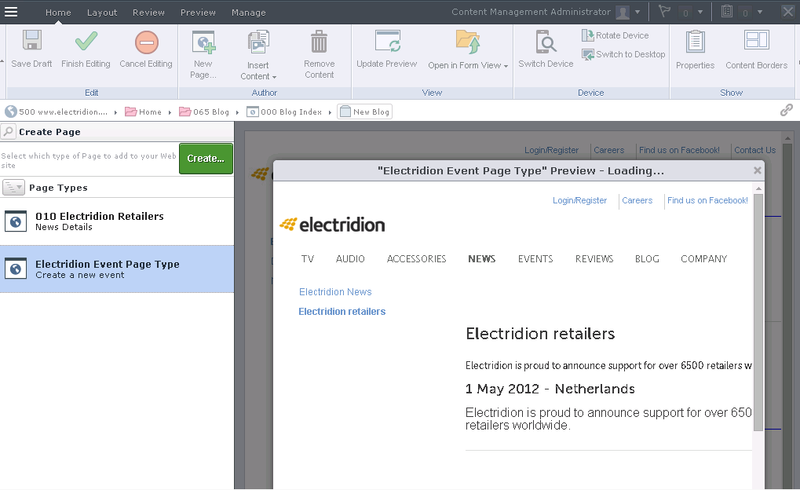 Tridion's Content Manager Explore, the "back office" interface, is much like any other business system (folders and forms following desktop software expectations). Its in-context GUI (Experience Manager), however, lets editors preview and update a "Staging" version of a website. System admins can create sets of content types based on example prototyped content (Components in Tridion). It's all configurable through check-boxes and selections, the real challenge is making sure the business and technical teams work together to set these up. Picking one of the available content types shows the (configurable) description. Tridion meets Eileen's selection criteria points ("Picking a CMS") in terms of format and updates. "What formats of field-level help text does the CMS support: single lines of text, paragraphs, pop-ups, hover text?" and "Can the instructions include HTML? A bit of simple formatting can go a long way toward readability." For field descriptions, Tridion has text and pop-ups (linking to anything). Tridion's basic CMS field description just uses text, but developers can make a pop-up out of anything "linkable" which creates a Custom URL for a field description. For example, I've linked field descriptions to (internal) Wiki pages to make them easy to update over time. Another approach is to link to an example of how the field is used. In this Custom URL example, you can see heading and subheading fields where the descriptions (and field definitions themselves) are configurable in the authoring form (Component), but there's also a pop-up help page. It only takes moments to link field descriptions to any webpage with Tridion Custom URLs. Customers that have used the system for awhile tend to build internal help guides and examples. For a great public example, see how Yale helps its community of Tridion users. Tridion's interface is also extensible and I've seen everything from custom help tabs to Custom URL pop-ups to help CMS users pick items from lists (that aren't stored in Tridion). "How hard is it to update the help text? As needs change over time, will adjusting the instructions be a hassle?" and "Can you change custom field labels used in the admin interface without affecting the machine name used in queries and front-end display?" Tridion's field descriptions are separate from the (XML) machine names and can be updated separately. You can change descriptions and even re-order fields without impacting the technical field names that template developers use. 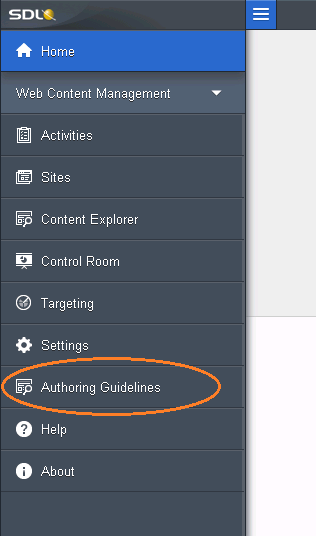 Part of this flexibility is the ability to define and configure nearly everything independently down to the authoring form field descriptions. You could even localize these descriptions to different languages for authors in other languages, without affecting the (XML) machine names used in templates and queries. Unfortunately, like other systems, though Tridion lets authorized users update the description, it's typically a developer activity unless we apply agile to the "back office" and not just the website. I've commented on that challenge with this little piece of satire. Apparently this is a challenge for other back-office systems. In addition to descriptions, Tridion's in-context interface gives editors visual help in the form of page type previews and template icons. 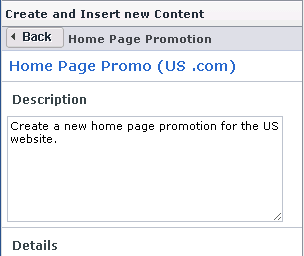 When making a page, editors can see a preview of the page as a pop-up. This could be to a live page or image. 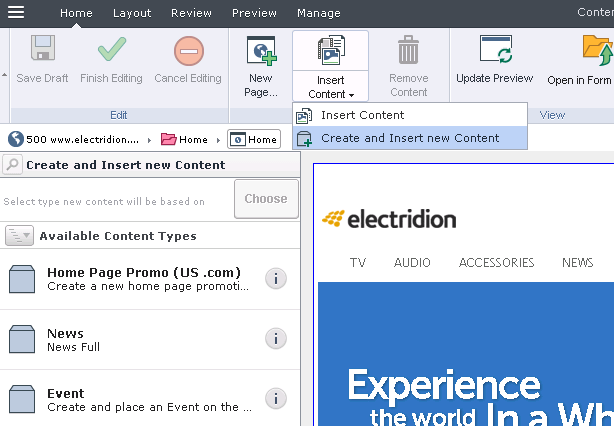 After creating content with a content template (called Component Template in Tridion) and for existing content, CMS editors can choose different templates. 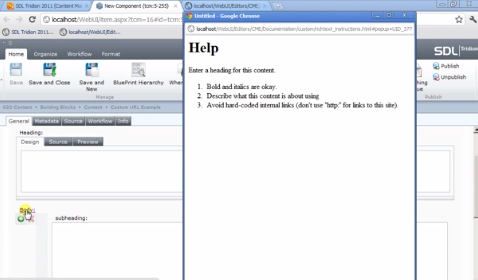 For higher-level integration for authoring help there's a configurable Custom Page feature and system administrator can configure new items in SDL's slide out navigation (see a technical example). Custom Pages are an old but possibly under-used configurable Tridion feature. I've used it to show other sites like editor help pages within Tridion's interface. Finally, Eileen Webb also mentions how you might choose a CMS or adjust your approach based on the authoring features. In terms of choosing a CMS, honestly, customers select Tridion for things like its BluePrinting feature (create variations of websites and the content, design, and organization related to them, while mixing central control with per-item localization), APIs for content management and delivery, and how Tridion works with translation, external systems, targeting, campaigns, the "contextual Web," and so forth. 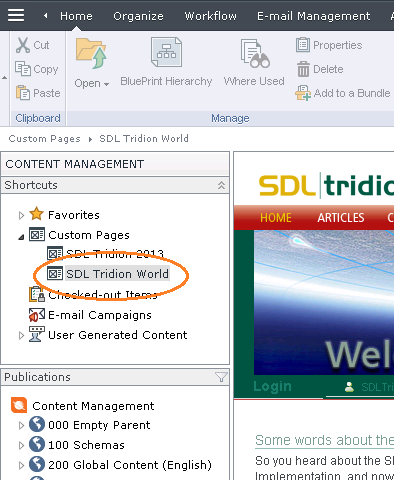 And even though there are SDL products and modules for translation, external systems, targeting, campaigns, and the contextual Web, Tridion plays nice with nearly everything (it can integrate with other systems in the CMS, during publish, in Web application code, or the front-end). In shorter words, aside from the "provide instructions to authors" check point in a Request for Proposal (RFP), a business won't choose Tridion mainly because of the help it provides authors but because of what it can do for the business and technical team. The good news is that friendly descriptions, pop-up help to other systems or even Tridion-managed examples, and visual descriptions are configurable out-of-the box. Now much of these will also have good default examples in the box. :-) It's ultimate flexibility balanced with in-context examples. Experience Manager, formerly called SiteEdit, ships with the latest version of Tridion.